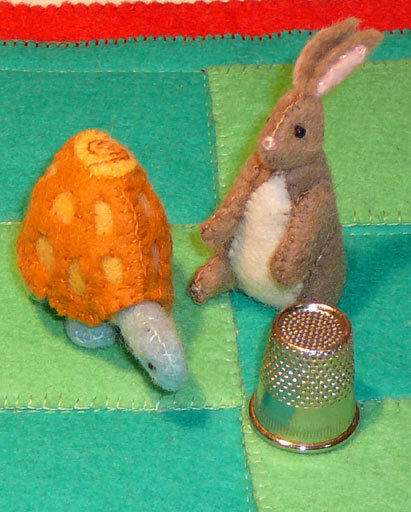 The fable of The Hare and The Tortoise has played in my mind since pondering on that situation a couple of posts ago. “Someday” I thought “I really need to make a hare and tortoise”. Time, however, seemed to be nor available so the idea has been sitting and surfacing, but other things have had to take priority. It was when faced with a decision of what to create for a swap that the thought of creating a Tic Tac Toe game presented. This game is also known as Noughts and Crosses. It is a well known game that requires co-operation and good sportsmanship as well as making an opportunity for learning about strategy and consequences. Considering these aspects it seemed that creating a hand-stitched version of this game would be fun and would present a learning opportunity, as well being a toy. Having decided on the this as a project, it then was necessary to consider what to make for noughts and crosses. In mind was the idea to create game pieces which would be more interesting and fun to use. I had mused on this idea over the years and had made quite a collection of sketches of little characters such as bugs and gnomes and bees, as well as cats and dogs and flowers and so many more. It was just a matter of finding the folder and revisiting and refining. It should have occurred sooner but, after sketching for several days, the actual theme flashed and that “aha!” moment rocked in to consciousness. The characters would have to be The Hare and The Tortoise. Not just one hare and tortoise, however, but five of each. The task took on another dimension as the pieces are small and fiddly and in spite of their diminutive stature required a lot of stitching and time to take form. After completion I feel that I have researched, contemplated, meditated and become totally immersed and absorbed by and with this theme. It has been quite a learning curve. This experience has enabled me to learn a lot more about tortoises and the difference between them and turtles. It has shown me what the symbology of both creatures imparts and their place in folklore and mythology. It has shown me the role they play in the environment and how fragile that is. What has also been gained is a deeper awareness of what the ancient wisdom seeks to impart and to realise that the essential aspect of this fable is not just that “slow and steady wins the race”, or that perseverance in the face of the impossible can give success, or never to underestimate your opponent or your own abilities but the also most importantly that where there is a will there is a way. Who could resist such adorableness. I’ll play. What a delightful post this is! 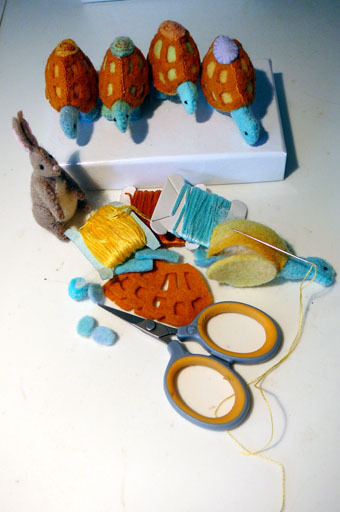 Thanks for sharing your musing and insights, and of course your creations are simply adorable. Well done!